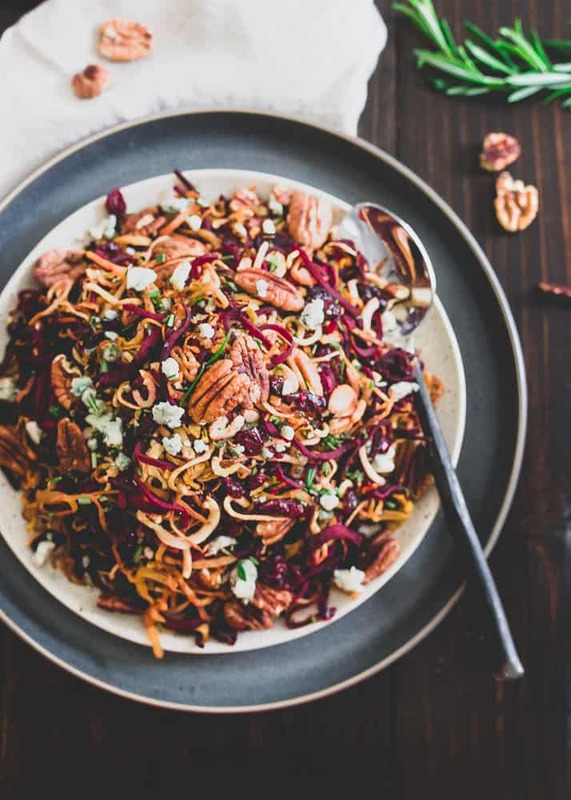 Spiralized beets and parsnips tossed with toasted pecans, dried cranberries, blue cheese crumbles and balsamic vinegar make this roasted winter root vegetable salad an explosion of seasonal flavors. Have your stomachs recovered from Thanksgiving yet? I hope so because I’m back with this roasted winter root vegetable salad today and it’s begging to be on your table for the next holiday meal – Christmas! Between the colors, the winter herbs and what I’m deeming to be the official nut of the holiday season, pecans, it’s the perfect fit. *This post is sponsored by the American Pecan Council. All content and opinions are my own. The idea to roast these winter root vegetables came from this recipe for Meyer lemon roasted carrot strings. 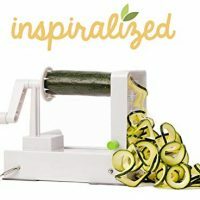 It’s one of my favorites for the winter season and now that I have a spiralizer, it’s a heck of a lot easier and quicker to get these fun noodle-like strings out of the veggies than using my julienne peeler (which served me very well over the years but sometimes you just need to upgrade, ya know?). I think beets and parsnips cut up into predictable roasted chunks leaves people likening them to what you’d find surrounding your everyday roast chicken dish. Nothing wrong with a good roasted chicken, but it’s just not very…special. 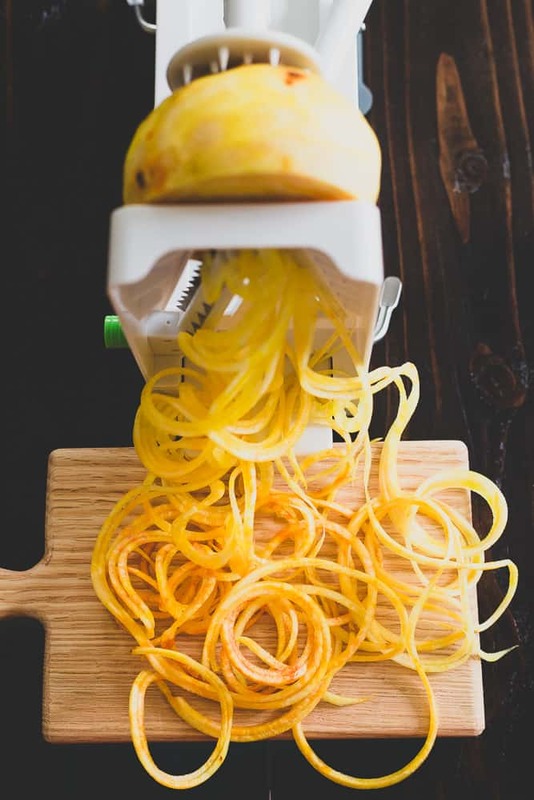 Spiralizing them into fun noodle strands breathes some much needed new life into these staple winter vegetables and I’m betting even the “beet haters” (I know it’s a divisive vegetable) will be tempted to try this dish. It’s not just about fun shapes though in this roasted winter root vegetable salad, there’s a huge flavor component going on in here we need to talk about! It’s been a tough year for pecans farmers, from international market swings to natural disasters. This holiday season, American Pecans is encouraging people to #PledgePecans – that’s a promise to add one pecan-friendly recipe beyond the pie to your table this holiday– and support local pecan growers and their families. Back at the end of August, I shared this sheet pan maple mustard chicken with pecans and sweet potatoes. The way the maple caramelized the pecans and brought out their sweet, toasted flavor was perfect as we worked our way into fall. Now, as we work our way deeper into the colder days of winter and approach Christmas, that same toasted warmth from the pecans adds a lovely heartiness, texture and layer of flavor to this dish. Pecans are the perfect nut to transition the seasons like that. To balance the buttery toasted pecan flavor, there’s a pop of sweetness from dried cranberries, a salty bite from the blue cheese, lots of brightly festive winter herbs (mmm, rosemary!) and some tangy subtle sweetness from aged balsamic vinegar (I actually used a maple balsamic I had from a specialty store which worked wonderfully in here). In short, there’s a lot going on in this dish but magically, all the flavors pull together and complement each other wonderfully in each bite. I know everyone thinks of pecans as the “pie nut” (which is funny to me because we never had that kind of pie in my family. In fact, this chocolate pecan tart was the first time I ever made anything resembling pecan pie) especially this time of year, but I’m hoping this recipe helps you think outside the realm of sweet when it comes to pecans! Visit AmericanPecan.com/PledgePecans for more delicious ways to bring this *heart-healthy nut to your table! #PledgePecans with me and the American Pecan Council and commit to making one more dish with pecans this season to support the American pecan farmers that bring this delicious nut to our tables. 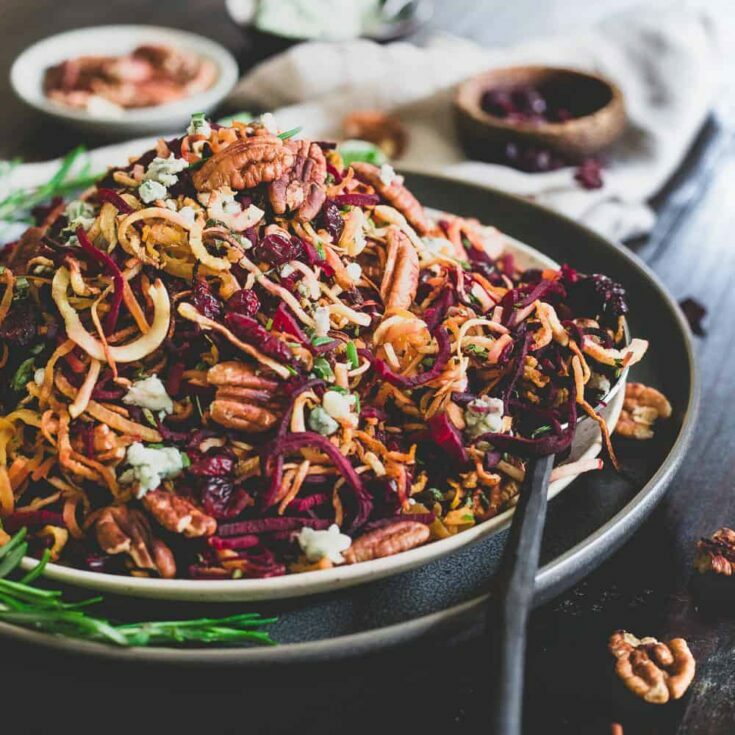 Of course, I’m going to suggest you go beyond the pie with this roasted winter root vegetable salad but if not, tell me what you’ll be making in the comments below. Spiralized beets and parsnips tossed with toasted pecans, dried cranberries, blue cheese crumbles and balsamic make this roasted winter root vegetable salad an explosion of seasonal flavors. Preheat oven to 425°F. Line 3 large baking sheets with parchment paper. 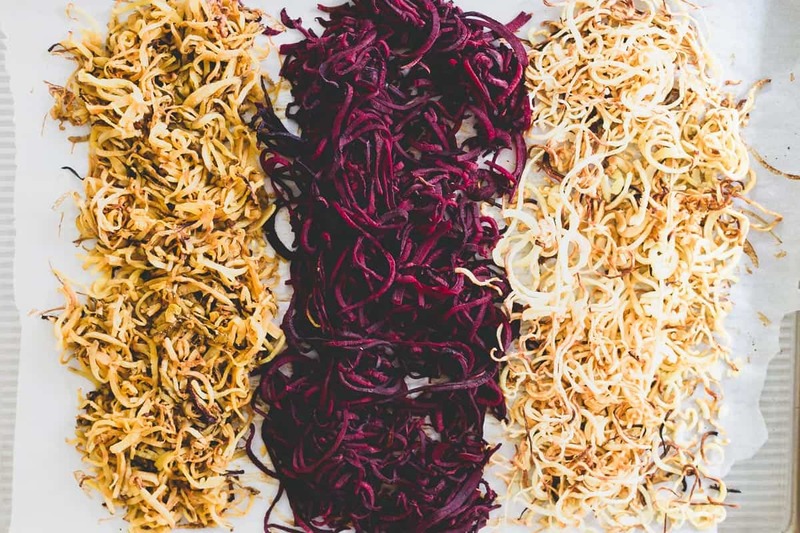 Spread each of the noodles from the vegetables out onto a baking sheet in an even layer (it's important to not overcrowd the sheets so they crisp up and roast rather than get soggy in the oven). Roast for 10-15 minutes, tossing and turning the sheet pans a couple of times. I found the parsnips were crispy before the beets due to their lower water content so adjust times accordingly and keep an eye on them while roasting. Meanwhile, whisk the olive oil and balsamic together in a small bowl and season with salt and pepper. Heat a small skillet over medium-low heat and toast the pecan halves until they become fragrant and just start to turn golden brown. Set aside. Once the vegetables are roasted, remove from oven and let them cool a few minutes. 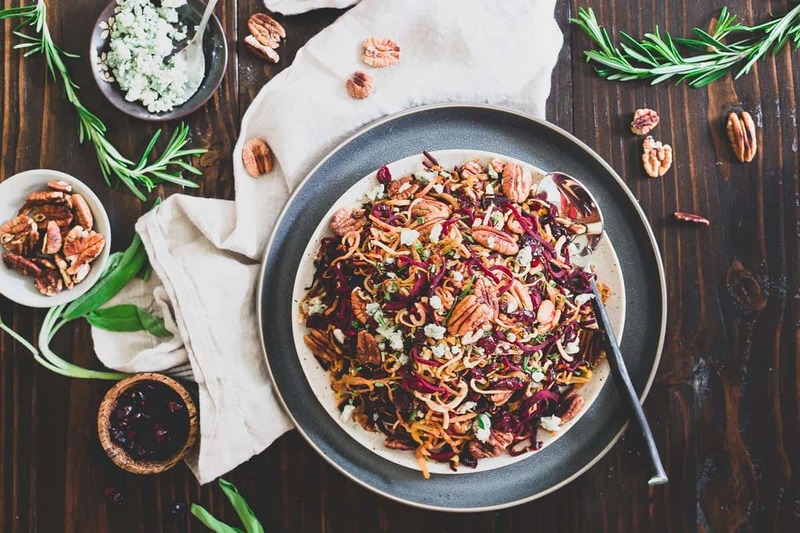 Combine the roasted vegetables, toasted pecans, cranberries and minced herbs in a large bowl. Pour the dressing into the bowl and gently toss to combine. Season with additional salt and pepper to taste and top with blue cheese crumbles to serve. *According to the U.S. Food and Drug Administration, scientific evidence suggests but does not prove that eating 1.5 ounces per day of most nuts, such as pecans, as part of a diet low in saturated fat and cholesterol may reduce the risk of heart disease. One serving of pecans (28g) contains 18g of unsaturated fat and only 2g of saturated fat. I am craving this healthy and hearty goodness! This salad looks amazing! Definitely making this! This looks incredible! Can the noodles be made a couple of hours before serving?